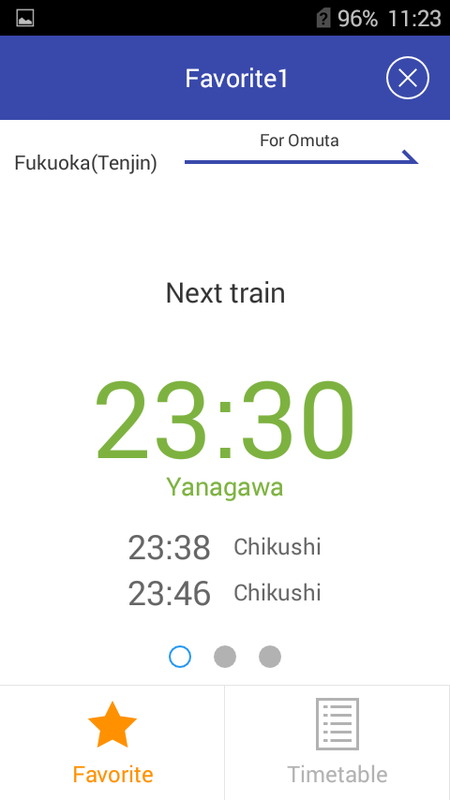 Nishitetsu Train Timetable is timetableapplication for Nishitetsu Train. You can easily check the timetable that registered station as'Favorite'. Ghost Leg is a method of lottery lotterydesigned to create random pairings between two sets of any numberof things.For example, chores or prizes could be assigned fairly and randomlythis way. 乃木坂46の握手会の握手券管理用のアプリです。握手会と握手するメンバーの管理を行うことができます。It is anapplication of the handshake ticket management for handshakemeeting Nogizaka 46.You can do the management of members shakinghands with handshake meeting. Check before going out.GoOutCheck is a useful application to lock the door andbelongings.So check items with the icon, you can understand that more easilythan usual checklist application. 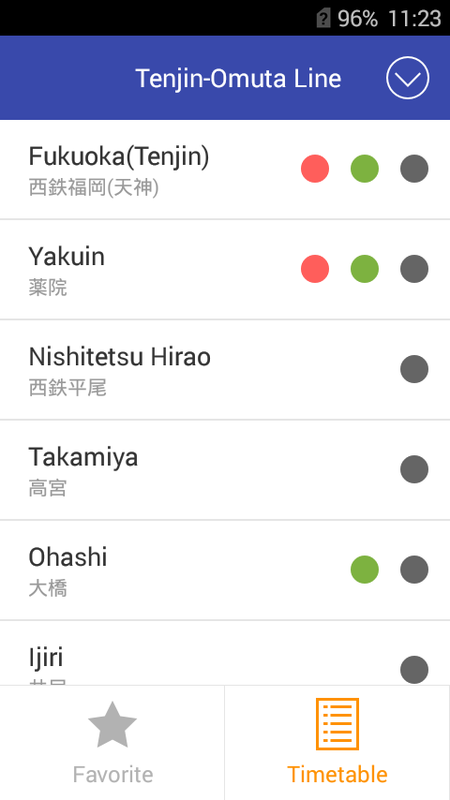 Nishitetsu Train Timetable is timetableapplication for Nishitetsu Train.You can easily check the timetable that registered station as'Favorite'. ＿人人人人＿＞ America ＜￣Y^Y^Y^Y^￣It is an application to create balloon text easily. 「北九州モノレール時刻表」は北九州モノレールの発着時刻を調べることができるアプリです。お気に入りに登録した駅は、トップ画面で直近3つのモノレールの発着時刻を簡単に確認することができます。また、オフラインでも動作するためAndroid搭載ウォークマンなどでも利用可能です。"Kitakyushumonorail timetable" is an application that can be used to determinethe arrival and departure time of Kitakyushu monorail.Station thatis registered in your favorite, you can see easily the arrival anddeparture time of the monorail one last 3 top screen.In addition,it is also available, such as Android-powered Walkman to workoffline. 僕は毎日に西鉄大牟田線の電車を乗りますが、久留米駅から天神までに行きやすいです。でも、小さい駅から小さい駅まで色々電車を乗り換えないと通勤時間は結構長くになります。例えば、三沢駅で「普通」を乗って、筑紫駅で「急行」に乗り換えますか、それとも二日市駅で「特急」に乗り換えますか、分かり憎いです。平尾駅から南に行く場合は時々大橋駅で「急行」に変わりますけど、これの代わりに薬院駅まで戻れば「特急」も可能です。それから、このアプリ！最寄りの駅・着駅を検索し、「直通列車」はあれば表示します。詳しくに調べたい場合は「乗換案内」を押して一番簡単乗り換えと到着時刻を表示します。可笑しいまたは分からない事がある場合は「デベロッパーにメールを送信」でメールを送って下さい。使用後のご感想・評価をお聞かせください。宜しくお願い致します。Iwill ride the train of Omuta Line Nishitetsu in every day, it iseasy to go from Kurume Station to Tenjin. But, commuting time andnot transfer the various train from a small station to the smallstation will be quite long.For example, riding a "normal" in MisawaStation, do you transfer to the "express" in Chikushi Station, orFutsukaichi Station can I transfer to the "Express", it is hatefulto understand. I will change to "express" sometimes in OhashiStation If you go south from Hirao Station, Returning to YakuinStation instead of this "Express" is also possible.Then, thisapp!Find the nearest station, destination station, "direct train"will display if. To display the arrival time and the easiesttransfer by pressing the "Transit" If you want to examine in moredetail.Please send mail, "send an email to the developer" If thereis that funny or do not know. Please let us know your impressionsand evaluation of after use.Thank you. ＼シンプルで使いやすい！乗換案内アプリの決定版／ 急いでいる時でも安心！圧倒的検索スピード！電車やバスはもちろん、飛行機も船もこれひとつ！ 「駅すぱあと」は【経路検索】【路線図】【運行情報】【時刻表】【始発、終電】全部搭載。全国のJR、私鉄(地下鉄)、新幹線、バス路線を網羅しているほか、新幹線、飛行機にも対応！ ■経路検索 - スムーズな乗り換えを実現！・目的地までの乗り換え、運賃、所要時間を簡単操作でご案内 ・駅名予測入力、履歴入力など多彩な入力方法・出発/到着時間の指定や、始発/終電の検索が可能 ・「安」(安い)、「楽」(楽チン)、「早」(早い)のアイコンを表示・高速バスや新幹線、飛行機などの交通手段もご案内 ・複数の経路候補を表示し、番線情報の対応路線も拡大 経路検索の便利機能 Myコース - 手間を省いて楽々検索！ ・通勤・通学経路などの頻繁に使う経路は「Myコース」へ登録すると、2ステップで検索可能 Myスポット - 最寄り駅すら入力要らず！ ・地図上の地点を登録しておくことで、周辺の駅や停留所から最適な経路をご案内 ■路線図 -全国の路線図を一気見！ ・地方ごとの切り替えや追加データのダウンロードは不要 ・スクロールや拡大、縮小も自由自在・駅名タップで路線図上でも路線検索や時刻表表示が可能 ・位置情報をONにすると、現在地周辺の駅の場所を表示 ■運行情報 -遅延・運休をわかりやすくお知らせ！ ・全国のJR、私鉄、地下鉄、新幹線の最新の運行情報を網羅 ・よく確認する路線を登録可能 ■時刻表- 旅行にも出張時にも見やすく！ ・駅名、バス停名から検索可能 ・縦型で見やすく、わかりやすく表示・各駅や特急、ライナーなど種別ごとに絞り込み表示も可能 他にも無料の機能が盛り沢山！ ・Myテーマ ・Myクリップ ・出口情報案内・キャンペーンや季節のお出かけ特集 ■□■プレミアムプラン■□■ アプリをもっと便利に使いやすく。プレミアムプランご購入で下記機能が使い放題！ ・酔っ払いモード ・乗換アラーム(一部無料でお試し可能です) ・区間運行情報・迂回経路検索 ・検索結果の列車選択 ・My運行通知 ・鉄道定期券の登録 ・新幹線、飛行機の時刻表・検索結果の候補数アップ(最大4->最大8) ・広告の非表示※プレミアムプランは有料オプションです。1週間無料でお試しいただけます。 ■ご注意ver2.3.0以下をお使いの方は、2018年11月26日以降経路検索がご利用いただけなくなります。アプリをアップデートしていただくようお願いいたします。\ Simple and easy to use! Transit guide application decided version/ Even when in a hurry safe! Overwhelming search speed! Of coursenot only trains and buses, but also airplanes and boats! "StationSoba After" is 【Route Search】 【Route Map】 【Operation Information】【Timetable】 【First Train, Last Train】 All Installed. In addition tocovering the whole country JR, private railway (subway),Shinkansen, bus route, it corresponds also to Shinkansen andairplane! ■ Route search - Realize smooth transition! · Guide fortransfer to destination, fare, required time with easy operation ·Various input methods such as station name prediction input,history input etc. · Designation of departure / arrival time andsearch of first / last train possible · Displays the icons of "an"(cheap), "easy" (easy ching), "early" (early) · Information ontransportation methods such as express bus, bullet train, plane ·Display multiple route candidates and expand corresponding route ofthe route information Convenient function of route search My course - Easy search with less time and labor! · Frequentlyused routes such as commuters and school routes can be searched in2 steps when registering to "My course"  My spot - even thenearest station is not required to input! · By registering thepoint on the map, guide the best route from the surroundingstations and stops ■ Route map - Take a look at the route map ofthe whole country at once! · It is unnecessary to switch for eachregion or download additional data · Scroll, enlarge, and shrinkfreely · Station name tap enables route search and timetabledisplay even on route map · When the position information is set toON, the location of the station around the current location isdisplayed ■ Traffic information - Let me know delay / cancellationclearly! · Covers the latest operation information of JR, privaterailway, subway, Shinkansen nationwide · Route to be confirmed wellcan be registered ■ Timetable - Easy to see both on traveland on business trips! · Searchable from station name and bus stopname · Vertical type for easy viewing, easy to understand display ·It is possible to narrow down display by type such as each station,limited express, liner etc. There are plenty of free features inaddition! · My theme · My clip · Exit information guidance ·Special feature of campaign and seasonal outing ■ □ ■ Premium Plan■ □ ■ Make the application more convenient and easy to use. All youcan use the following functions by purchasing the premium plan! ·Drunk mode · Transfer Alarm (Some trials can be tried free) ·Section operation information · Detour route search · Trainselection of search results · My operation notice · Register railpass commuter pass · Shinkansen, airplane timetable · Increasenumber of search result candidates (maximum 4-> maximum 8) ·Hide ads * The premium plan is a charged option. Try it free for aweek. ■ Attention People using ver 2.3.0 or lower will not be ableto use route search after November 26, 2018. Please update theapplication. This app is not official app which Nishi-Nippon Railroad Co., Ltdoffers. This app access to the Nishitetsu Web page. When Web ismaintenance, etc, this app cannot display information. [How to Use]Select departure and arrival bus stop from spinner. You cannot findbus stop, select "Search Bus Stop" and find stop. Click "Real TimeInfo" button, show the timetable. Click the list, the detailinformation is shown. "Schedule" button link to Nishitetsu officialweb page. 乗換NAVITIME Tokyo Japan is a transfer information app that allowsyou to easily search for necessary information such as timetablesand route information anywhere in Japan, easy to understand routemaps, and the locations of boarding areas to transfer smoothly. Itsupports not only trains, but also provides transfer routes, traveltime, and fares for nationwide air travel, city buses, highwaybuses, ferries, and more. 通勤や通学、お買い物などで電車に乗ろうとホームまで来たら、乗りたい電車が出発したばかりでずいぶんと待ち時間がある。こんなことなら、駅の側の喫茶店にても行ってたら良かった・・・ということはありませんか？そんな時に、この「あと何分？」アプリで、あと何分後に電車が出発するのかを知ることができます。しかも最大１０本先の電車まで表示しますので、「ちょっと一服して３本後の電車で行こう」なんてこともでき、時間の有効利用ができます。日本全国の時刻表に対応しており、いつもの駅の時刻表を複数登録することができます。 Home until you come tocatch a train commute, such as shopping, there is a waiting train alot you want to ride has just starting. If such a thing, or so itdoes not ... it was good if I also performed at the cafe on theside of the station? It is possible to know in such a case, withthis app, "many minutes? After", the number of minutes later afterthe train or to departure. Moreover, since you display up to 10trains of the largest destination, it can also be is! "Let's go bytrain of three after the smoke a little," you can be effective useof time. It is compatible with the timetable of Japan, it ispossible to register multiple timetable station usual. 福岡（天神）駅って、２階まで上がって改札の向こう側を見ないと次の列車が分からなくて不便じゃないですか。「西鉄こんどの電車」は起動するだけで最寄りの駅を検索し、今度の電車と次の電車の時刻を表示します。機能はそれだけです。タイトルバーのアイコン左側をクリックすると路線図が現れます。表示された駅が違ってる場合、現在地が取得できなかった場合は、路線図から駅を選択してください。駅から遠い場所にいる場合は、駅が検索できません。西鉄大牟田線のみ対応してます。IFukuoka (Tenjin) station, it Is not inconvenience the next trainnot know If you do not see the other side of the ticket gate and upto the second floor.Find the nearest station "train Nishitetsu now"just starts, it displays the time of the next train and trainnow.Function's it.Route map appears when you click the icon left ofthe title bar. If a station that is displayed is wrong, if thecurrent position can not be obtained, please select a station fromthe route map.If you are in far away from the station, can not findthe station.I only supported Nishitetsu Omuta Line.